Obituary – DeBord, Charles Thomas « Perry High School Alumni Association, Inc.
﻿President of Homeroom 47-48, F.F.A. 45-48, Reporter of F.T.A. 47-48, Business Manager Football Queen 45-48, Student Council 45-46, Treasurer of Sophomore Class 45-46. ﻿Charlie DeBord, 67, long-time farmer-rancher in the Perry community, died at 6:55 a.m. Thursday, Jan. 29, 1998 at Stroud Municipal Hospital. Funeral will be at 10 a.m. Saturday at the First Christian, Church of Perry. Rev. Lynn Scott will officiate. Burial will be in Grace Hill cemetery. A memorial has been established to benefit the Oklahoma Medical Research Foundation. 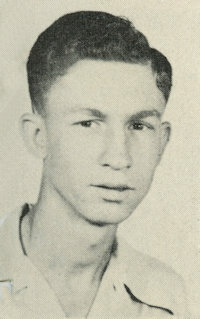 DeBord was the son of V. K. and Helen (Stout) DeBord and was born at Perry on March 6, 1930. He was a graduate of Perry High School and attended Oklahoma A&M. He was married to the former Helen Daniel for 22 years. DeBord was a member of the First Christian Church, Texas Cattle Feeders Association, American Quarter Horse Association, National Cattleman’s Association and Noble County Cattleman’s Association. Survivors include three sons, Edwin DeBord, Perry, Monty DeBord, Chandler, and Jay De Bord, Amarillo, TX; one daughter, Brenda Sorenson, Stillwater; four grandchildren and one brother, Vernon DeBord, Oklahoma City.